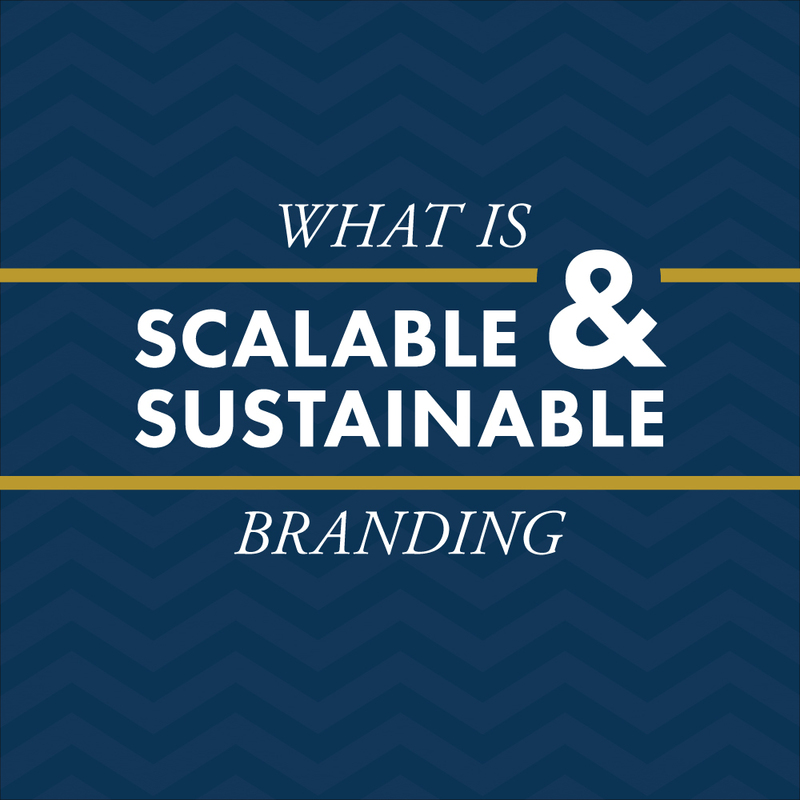 Son of Erik Design — What is Scalable & Sustainable Branding? Why is it that so many small businesses have such horrible logos and branding? In my experience, most small business owner's don't know how to build a successful brand and have no clue where to turn for quality graphic design services. So, what do they do? They attempt to tackle it themselves to save some money. On the surface, this seems completely understandable because starting a business can be very expensive, and with everything else you have to invest in, wouldn't it just be easiest to throw some artwork together yourself? This is a very common fallacy about the value of great design. This mistaken belief is caused by thinking of branding as a commodity instead of an investment in your business's future. I'll talk more about the importance of changing that mindset in a future blog post. For now, let's talk about the damage of a poorly designed brand. Brands are made of a lot more than just logos, you can read more about that here, but for the sake of simplicity, I'll focus on logo design for now. Like I said before, we've all seen cringe-worthy logos while we are out and about, but why should the business owner care if their logo is bad? For one, it is the face of the business and the first impression that most customers will have of the products or services being offered. If it looks like a 3-year-old threw it together, what does that say about the business itself? And two, It is extremely difficult to scale a poorly designed brand. Scaling a brand means that it can grow and develop as your business finds new success and expands. If you don't invest in a good branding foundation upfront, you will pay for it later, often at a greater expense. A number of years ago, while I was attending university for graphic design, I decided it was time to approach my dad about fixing his business's logo. He had owned the business for years and had always just used the logo that was available when he bought the business from his brother. I sat him down and walked him through why the current logo was poorly crafted and needed some work. We agreed that the idea for the logo wasn't terrible, so we decided to just focus on refining the it instead of a full redesign. Now, I'm not claiming that the new version is a perfect design, but when you see them side by side, you know which one represents the business better. The letters in the old logo have line weights that vary greatly from one letter to the next. The D, R, A, and B appear bold, and everything else is very thin, not to mention all of them are clumsily built. The business name sits on top of the gears which makes it hard to read, especially at a glance, and the colors are dull and dingy. To make matters worse, the only version of the logo that they had was this pixelated jpg, which means forget about using it for anything much larger than a business card. Poorly designed logos are a crumbling foundation for the rest of the brand to build on. And this is finally where the word "Sustainable" comes in. If you have read this far, I congratulate you! When I say "sustainable" I don't mean that it's non-GMO, organic, and great for the environment. I mean that businesses cannot sustain growth with terrible logos serving as the basis of their entire brand. In fact, even well-known, successful brands are refreshed or completely rebranded from time to time to better meet the changing needs of their market and customers. To prove my point, let me show you Apple's original logo. Yes, Apple, one of THE most valuable and powerful companies IN THE WORLD (said with diabolical voice). Here it is in all of its highly detailed, textured, stippled black and white glory. Now, where this would probably turn out great on a dot matrix printer, it's a horrible logo for pretty much everything else. You see, the idea behind Apple's logo was to illustrate the moment when an apple struck Sir Isaac Newton on the head, giving him the idea of gravity. You still with me? So, they decided that they would fully render that scenario happening, then wrap it in a highly detailed banner. Not only that, but there is an inscription around the border of the frame that says, "Newton --- A mind forever voyaging through strange seas of thought --- alone." A detail that most humans would never notice or be able to read because of the tiny size. The idea was good. The execution as a logo, not so much. Can you imagine Apple still using this logo today on the back of computers, iPhones, iPads, etc.? Why not? Well, pick a reason: it's too detailed; too textured; the symbolism is lost in all of the fluff; the name can't be separated from the rest of the logo; at a small size, you wouldn't be able to tell what is going on; etc, etc, etc. It wasn't sustainable for Apple to continue using this logo for very long. In the end, they distilled the real meaning from it, the apple - the idea that sparks innovation, and they started using it instead. The apple has had several iterations through the decades, but the ultimate simplicity remains and has been a solid foundation for Apple to build its brand upon. Now that you have read a bit more about what scalable and sustainable mean – where do you see your brand in 5, 10, 20 years? Is your current logo and branding designed in such a way that it could get you to one of those benchmark years? Or are you concerned it won't get you to next year? This is the issue that many small business owners face every day. The only question is how are you going handle it? Ride it out and see what happens? Or fix the issue before it becomes a problem. Let's chat.